Usually when I get really scared, I feel an increased urge to ... use the facilities. But what happens when you're actually using the facilities, and a huntsman spider clambers up the bathroom wall a mere three feet from you? It's one of those cosmic paradoxes which for me threatens the Space-Time Continuum itself. Thanks for the photo, Suzanne. That would be an instant heart attack waiting for me...(not all witches are fond of large imposing spiders). I really enjoy reading your blog, so much that I would like to mail-subscribe to it. Would you let me know where can i find the link for it? I'll take this opportunity to invite you to my blog, titled "Tales from The Amazon and assorted short stories" I'm sure you would enjoy it as well. I LOVE these little spiders ! They are free to live in my house until the population gets too large - then a few get relocated !! But what do you DO when you see one? Do you shoo it away from you (what if you were using the bathroom?! Ugh!)... I just had a freakout fit over a ladybug flying at me... I'm going to Oz later this year and I'm not sure how to handle one of those creepazoids! These are not "little spiders" - this one is the size of my hand. If I see one, for the most part, I ignore it. 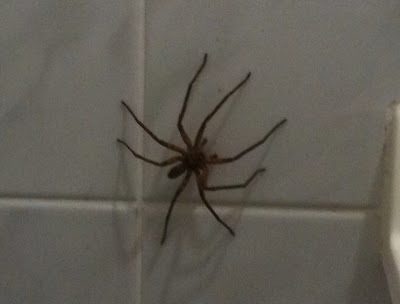 If it touches me, or sneaks up on me while I'm on the loo... well, this one died. In a not-happy way. And then there was this, which makes me worry a bit!